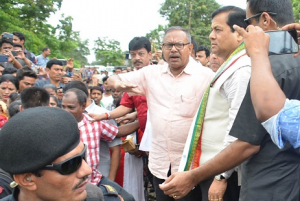 In view of the devastating flood that swept across the three districts of Barak Valley, Assam Chief Minister Sarbananda Sonowal announced a flood package of Rs 100 crore for relief and rehabilitation in the valley. 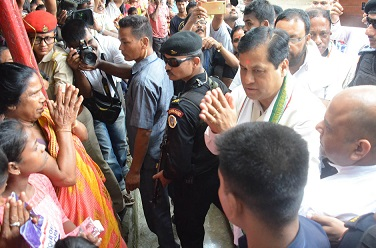 After taking stock of the prevailing flood condition of Karimganj and Hailakandi districts on Saturday and Cacher district on Sunday during his two day visit to the flood affected Barak Valley, Chief Minister Sonowal asked the Government machinery to reach out to the flood affected people and extend all possible help. Sonowal also visited Sivbari of Silchar town and took stock of the flood-ravaged Silchar-Kalain road. 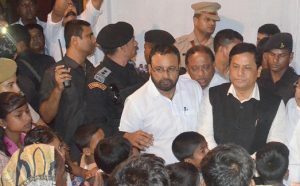 He also visited a relief camp set up at Silchar Government Boys Higher Secondary School and interacted with the camp inmates. He also took stock of the extent of damage caused by flood in a meeting held at the conference hall of DC Office, Silchar in presence of the MLAs and senior Government officials on Sunday. Chief Minister Sonowal also asked the Government officers to reach out to the marooned people. He at the same time asked the respective district administration to assess the flood induced damages and submit a report to the government with the help of the local MLAs. Sonowal during the review meeting asked the Animal Husbandry and Veterinary Department to rescue the marooned animals and render all possible help to provide fodder and medical treatment to the stray animals. He also asked the district administration and Agriculture Department to assess the damage of crops and agricultural land, caused by floods and prepare an area-wise report and submit the same to the Government. Sonowal at the same time asked the department to organise capacity building programmes for the farmers and prepare them to seek help and compensation under Prime Minister’s Fasal Bima Yojana. The Chief Minister also asked the Health Department to be on its feet and form health teams to be deployed at the rural areas to deal with any possible chances of outbreak of any diseases after flood water recedes. He also asked Joint Director Health Services to take steps for the generation of health related consciousness to the people to help them to tackle any post flood epidemic. Stressing on pure drinking water for the common people, Sonowal asked PHE Department to provide purified water to people. He also asked the department to collect water samples and undergo requisite testing and take remedial steps to avert any possible chances of water borne diseases. He took stock of the strength of the embankment and asked Water Resources Department to carry out any repair work of the breached embankments along with operationalising sluice gates. The CM also took stock of flood induced damages of Fisheries and Power Departments and asked the senior officers of both the departments to render all possible help to the flood affected people. Water Resources Minister Keshab Mahanta, Environment and Forest Minister Parimal Suklabaidya, MLAs of Borkhola, Udharbond, Silchar, Lakhipur, Katigora were also present during the meeting.